We think that log burning fires and stoves are an ideal solution for the modern home, both from an environmental point of view and a financial one. It’s no surprise, therefore, to find so many modern homes including them and others converting to them. 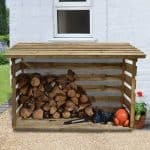 Once you need logs on a regular basis, however, you’ll also need somewhere to store them, and that’s where this well dimensioned log store can prove invaluable. 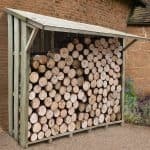 We’ve reviewed log stores in many styles and sizes, but this is one of the largest purpose built log stores that we’ve seen. 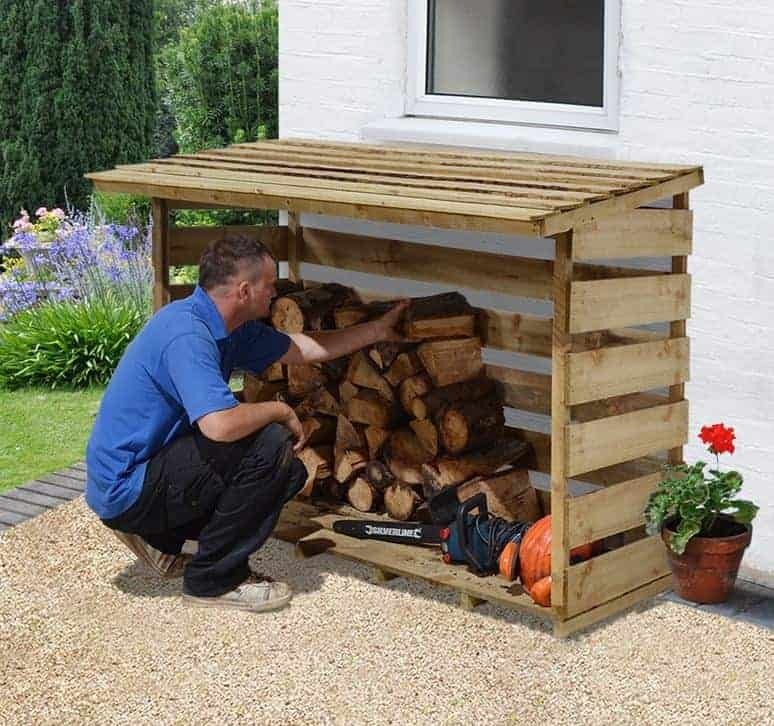 This makes it perfect for larger houses, or simply for those who want to save time and money by purchasing and storing large amounts of logs at the same time. 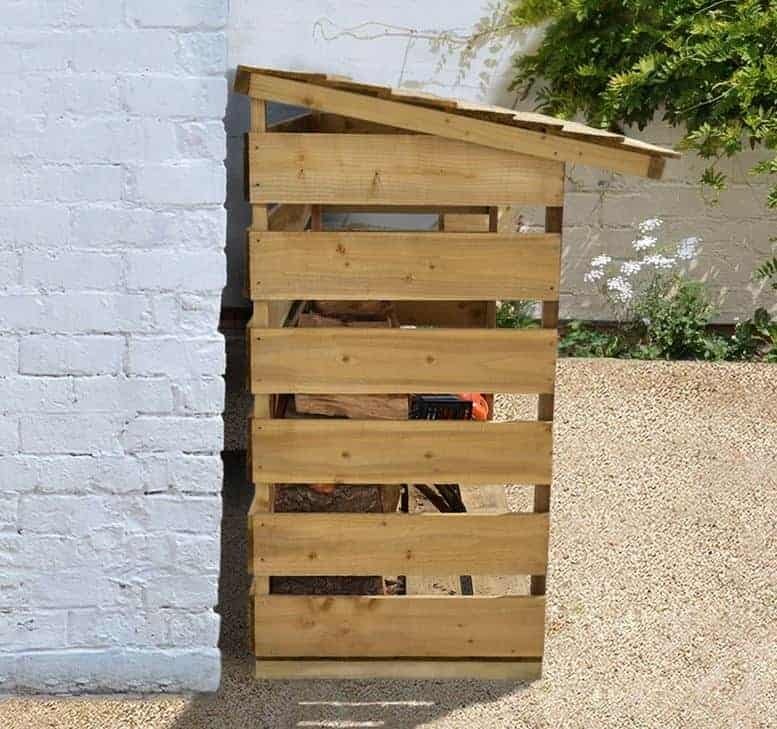 Easy to construct, it can be positioned next to a wall, or at the side of a deck, shed, or workshop. The thing that most impressed is was just how sturdy and durable this log store is. Despite its highly affordable price, we found that no corners had been cut, as shown by the fact that all the timbers have been pressure treated. This gives them excellent weather resistance, a fact that is backed up by a very long 15 year anti-rot guarantee. 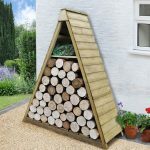 The more logs that can be held in a store, the more effective it is, which is why we were so impressed with this particular log store at first sight. It was obvious that this is one of the more accommodating stand alone log stores that we’ve seen, and the measurements confirm that it has a ridge height of 1.29m and an eaves height of 1.13m. You’ll also want to know its overall width and height when deciding where to position it, which are 1.76m and 0.60m respectively. This means that you can fit a log of logs safely inside. The store has a traditional timber design that we liked, and which we think will look good if placed against a timber shed or decking area. 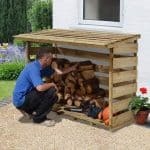 It features an open front, to make the loading and unloading of logs easy, and has slatted sides and roof. This allows lots of air to reach the logs themselves which can ensure that they’re in optimal condition when used on a fire or in a stove. One of the things that impressed us most about this log store was just how thick its cladding is. The side panels and floor are both made of square board with a thickness of 16mm. This makes it very strong and durable, and we have no doubt that it will stand up to the knocks that log stores can be prone to. The roof is also made of this same softwood hardboard, but although its thickness is only 10mm that should still be enough to provide durability. The wood itself offers some protection from the weather, as does the initial preservative treatment used by the manufacturer, but of course the slats do allow rain inside. That’s why we would have liked to see an all weather cover provided that could be used when it rains. If you wish to create a solid unslatted roof, the natural pitch created by its pent design will carry rain and snow effortlessly away. We were very pleased to see that pressure treatment had been applied to the timbers, as this is a process that could easily have been missed out on a store that costs less than a hundred pounds. In the process, the timber is placed into a vacuum and then has wood preserver forced deep inside of it. This gives very long lasting protection against wet rot, as is shown by the long 15 year manufacturer’s warranty. 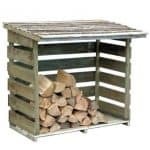 This is as long as we see provided on any log store, and longer than we find on many of the sheds we review. Because the treatment lasts so long, there is no requirement for the customer to add any treatment of their own. We would however advise painting the timber if you want to avoid it fading in the sun. As it is, the initial pressure treatment gives it a subtle green tinge which many people will like, but if left as it is this can quickly turn to a silver or grey colour. 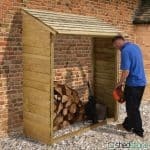 This is designed to be a log store, of course; a function that it carries out very well. Because of its size, however, it can also be used to store papers, tins or other recyclable material before they are collected or taken to a recycling centre. One other possible used is as a play area or den for young children. 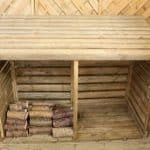 This use can be facilitated by adding a tarpaulin or covering, to create an all weather environment children will love. For a relatively small and inexpensive structure, we were pleased to see such attention given to quality, as shown by the use of pressure treated timber. The cladding itself is thick enough to withstand the effects of weathering, and the deep lying wood preserver will help to keep rot away. This is one of the largest pent style log stores we’ve seen, and it’s surprising just how much you can fit inside. It was good to see that all the fixtures and fittings were included, along with clear instructions. Even without a friend’s help, it’s possible to assemble this store in around two hours. With a generous storage capacity backed up by a high build quality, we feel this represents good value at under a hundred pounds. 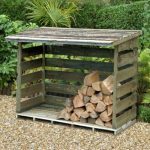 Final Thoughts: There are many log stores on the market now, but at this price and with such an accommodating storage space we feel that this has to be worthy of consideration. 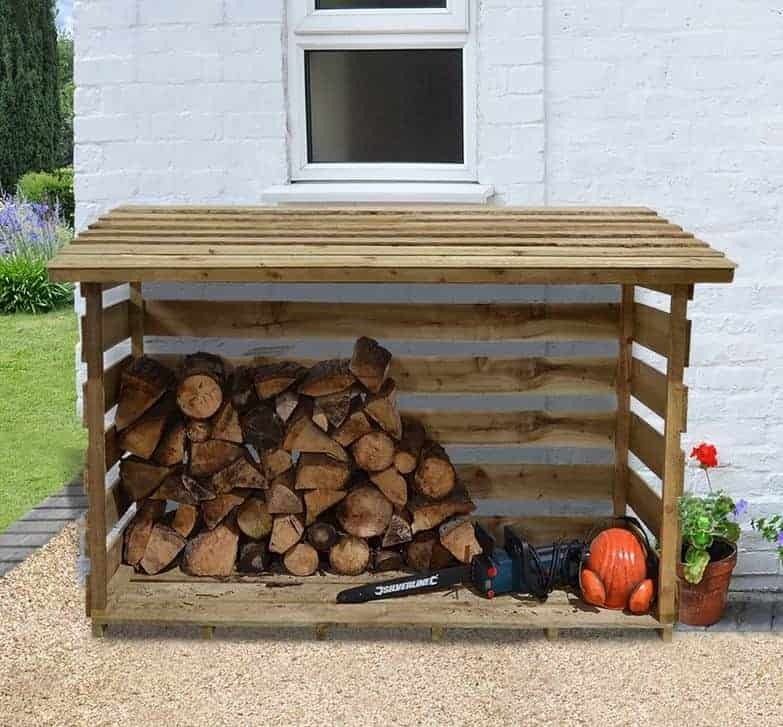 Put simply, if you have or plan to have a log burning fire or stove, then having a log store will save you time and money as you can have a plentiful supply of fuel waiting whenever you need it. 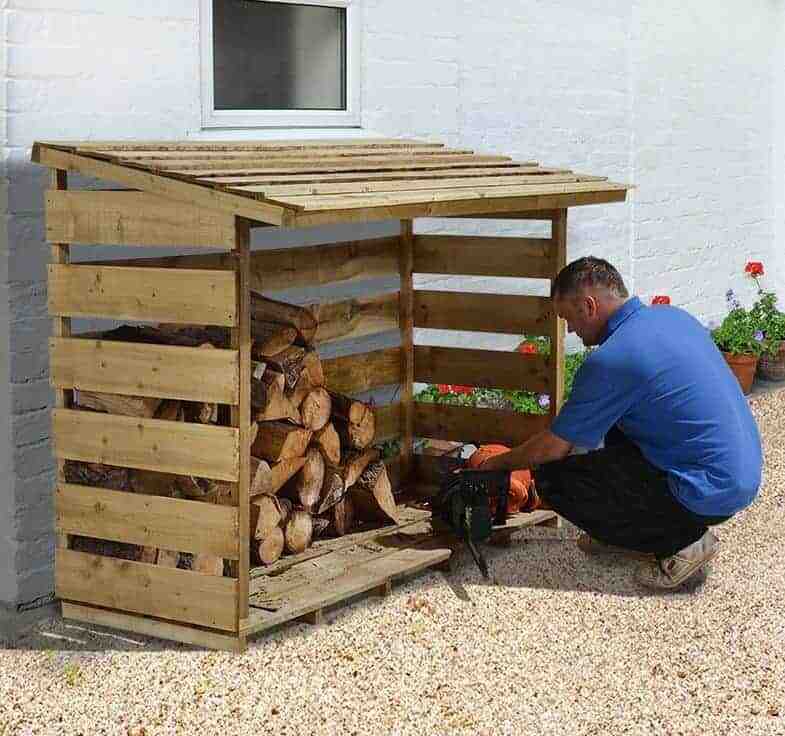 If your shed doesn’t have an integrated log store, then this makes a very good alternative, and we were especially pleased to see that it had been given very effective weather protection thanks to its initial pressure treatment. That means that you won’t have to worry about the durability of your investment for at least 15 years, as demonstrated by the manufacturer’s warranty of this length, simply assemble it and use it.